I’m not predisposed to emotional outbursts, a result of an upbringing under the dour grey skies of Northern England. So I thought twice about writing this blog. Not because I’m afraid of showing emotion, or of expressing my opinion; it’s more that, in the face of overwhelming suffering, whatever I write might sound trite or, worse, self righteous. “Sitting here in my safe European home”, as The Clash song goes, I feel a profound shame at our collective failure to respond to the humanitarian crisis unfolding between Europe and Syria, Iraq, Eritrea, Afghanistan, Libya, Nigeria…on and on the list goes. My writing about it isn’t going to help. Yet warm, dry, safe in my Dutch home, I feel compelled to write. 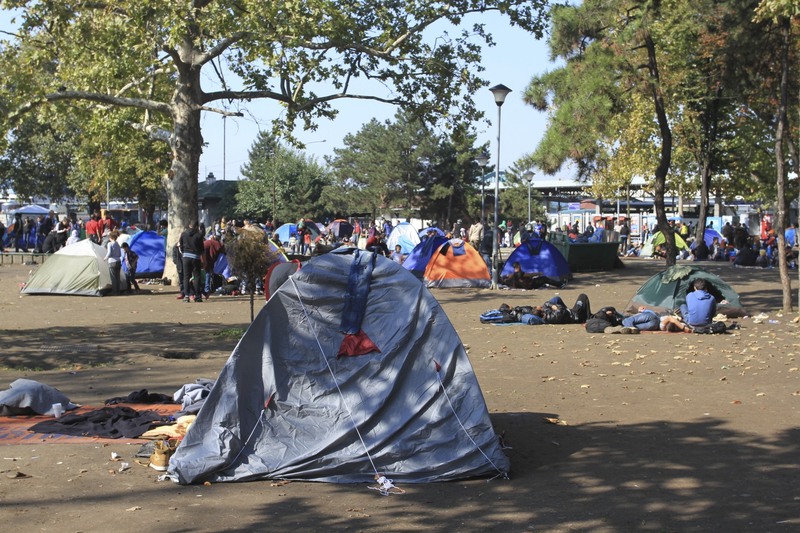 It’s a different story for the thousands of refugees I witnessed recently in Belgrade. People torn from their homes, separated from their families, throwing themselves into a terrifying world to escape an even more terrifying fate. To many, these people are migrants, a term now loaded with loathing. A term that seems interchangeable with ‘non-person’ or ‘sub-human’ in the minds of some. I find that attitude repugnant. I’ve never seen more humanity, however desperate, however impoverished by circumstance. 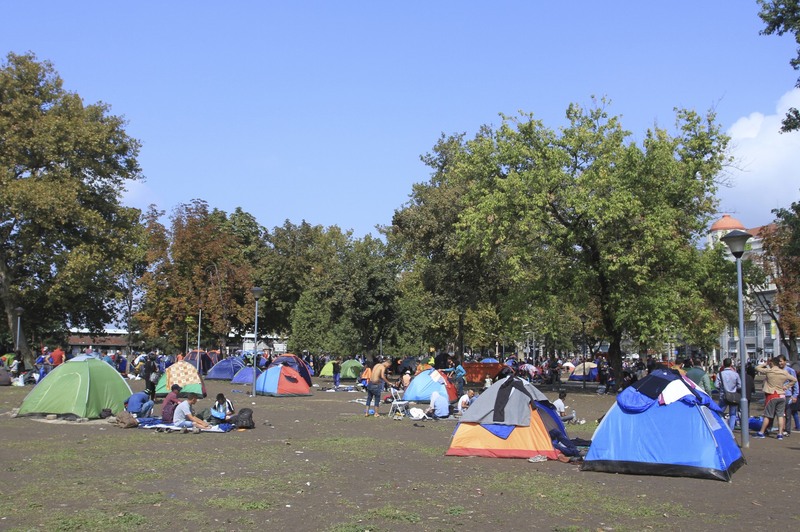 The people – mainly from Syria and Iraq – sleeping rough or in tents in the parks of Belgrade, contrast sharply with the lack of humanity shown to them by Europe’s political class. 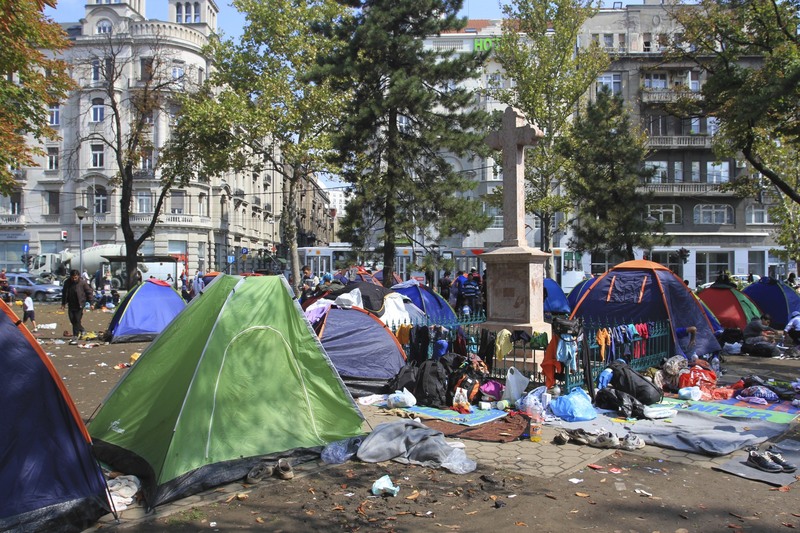 I found myself staying in a hotel overlooking a refugee transit camp in central Belgrade – irony doesn’t get much more ironic than that. It was raining hard when I first arrived and conditions in the park deteriorated quickly amongst the temporary shelters and inadequate tents. There were no international agencies, no EU, just local (inadequate) services, and the kindness of ordinary Serbs. 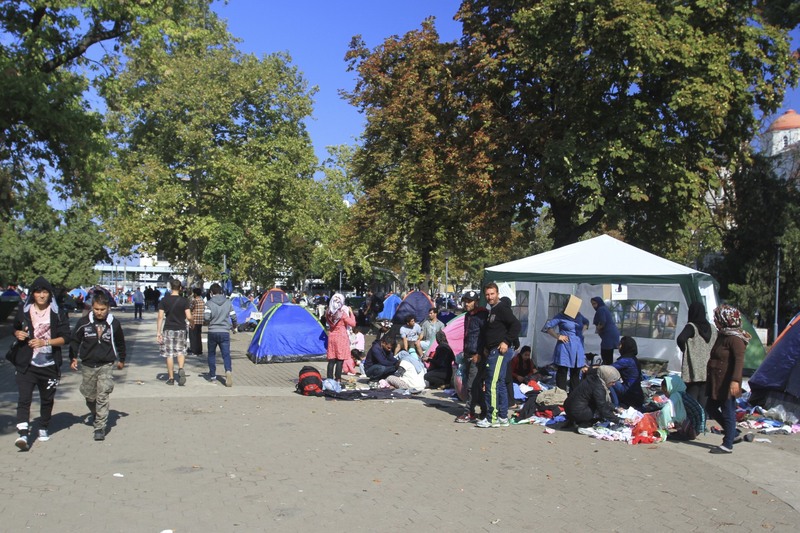 After walking through the camp and meeting a few people – a remarkable number of whom speak English – my conclusion is that it is, and our politicians are, profoundly immoral to do next to nothing to help each and every refugee fleeing war and terror. As an individual, it’s overwhelming to witness so many men, women and children, young and old, trying to find safety. It made me feel helpless. Surely though, it’s not beyond the ability of the wealthiest continent on the planet to do better than this? I’ll leave off the moralising, the political commentary, after all there are acres of newsprint and hours of TV broadcasts to fill that gap. I won’t even point the finger of blame at those who are ultimately responsible for this crisis…you know who you are. I’ll say only this. 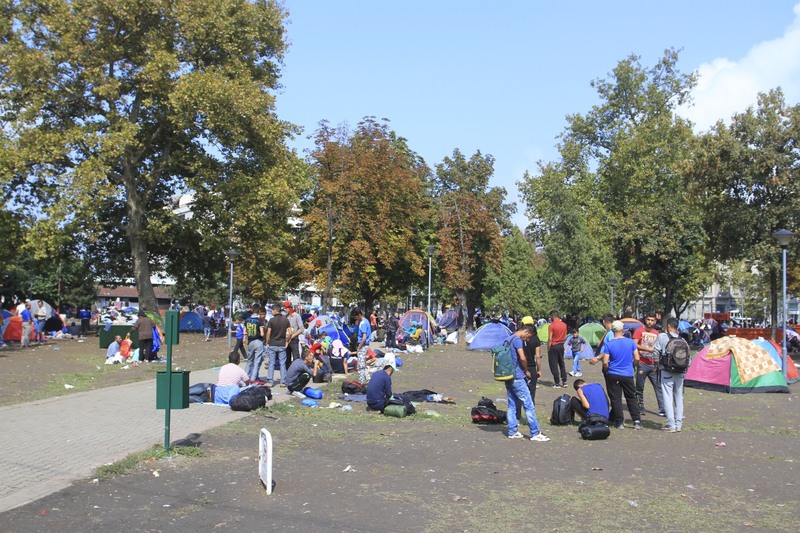 It’s easy to dehumanise the vulnerable, the weak, those in desperate need; and, because it’s easy, we must all keep reminding ourselves and our politicians that the people in the parks of Belgrade, lost at sea in the Mediterranean, and scrambling to cross a border in the hope of living a life of dignity, are just that, people. If we value our own dignity, we must value theirs also. A nice post Paul. With the right words. And words do have effect, albeit limited maybe, but they do. All those last weeks I’ve been thinking about the spaniard refugees fleeing to France in 1939, after Franco’s victory over the Republic. Approximately 465,000 people fled Spain, often on foot across the Pyrenées mountains, men, women and children. They were often welcomed and treated well, sometimes not. I want to think the latter was the exception. The fact is, most stayed in France. The other fact is, that half a million people posed tremendous logistics problems. Food? Water? A roof? Most at first were directed to hastily erected camps. Wood barracks. Straw for litter. Many sought to fight in the war that shortly ensued. And I insist, Most stayed in France, and after the war, any kept on coming fleeing Franco’s rule. What do we have now? What do we SEE now? Our own Spanish Civil war. And authorities totally out of their depth? (Whether they have any depth at all is another question). Each EU country taking an individual stand. Cops hitting fathers in front of their little children. And no-one willing to even set up minimum logistics. I insist on the term: to ease the suffering and the pain, part of the strategy (for lack of a better word) is also a matter of logistics: feed, give water and shelter to half a million people. I don’t think we’ve seen it yet. Dankje wel for sharing this post. Thanks Brian. I know descendants of Spanish refugees who settled in Liverpool after Franco’s victory, but I didn’t know about the mass exodus from Spain to France. It’s obvious really, just hadn’t considered it! It’s funny, I was in Antwerp the other week at the Red Star Line museum, which is largely dedicated to chronicling the migration of nearly 3 million European’s to North America. We seem to have conveniently forgotten that part of our history in this current crisis. Dealing with such large numbers of refugees is going to be difficult, but a continent as wealthy as this one can surly respond better than this? Political point-scoring aside that is. Better yet, do more to solve the route problem, Europe has stood on the sidelines for years and watched the situation go from bad to worse. That’s now opened the door to Russian military adventurism, which is unlikely to improve things, it certainly isn’t going to stem the flow of people from Syria. I personally witnessed a more recent exodus. in 1962, at the end of the Algerina war, between half a mil and a million french “pieds-noirs” fled Algeria for France. Some were french, other spanish, other jewish. They said it was “suitcase or coffin” for them. They piled into ships. Landed in Marseille. I was about nine, my father had made a mistake in flight arrangements from Guinea where we lived, and we landed in Marseilles instead of Paris. Everybody was crying. I was about nine. Made a strong impression. I still remember all those people. Some of the men were crying. It must have been an extraordinary experience Brian. A few years back I read an excellent history of french Algeria and the pied-noir, but I knew a little of it because de Gaulle’s decision to withdraw from Algeria was the backdrop to Frederick Forsyth’s novel, Day of the Jackal…not an ideal way to learn history, but enough to prompt me to learn more!